Where is my T-Hunt ? Many of the collectors are looking for T-Hunt cars, but it is very very difficult to get it from the display shelf. If you managed to get some in the passed, that day was your lucky day, you should also try Toto Mega 52 next time. So have you wonder where are all the T-hunts? 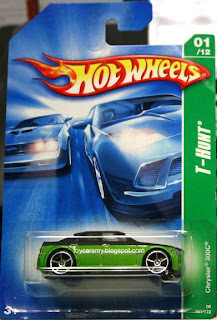 Each box of Hotwheels content only 1 T-Hunt car, in few boxes it could be a Super T-hunt (T-Hunt$). Super T-Hunt is similar to T-hunt car but it come with the blink blink rims and rubber tyres. Due to its double rare to find, it worth higher market value. In the huge hypermarket, usually (I dare not say all) T-hunt has been "filter" by the insider. You will not see it hanged on the shelf waiting for you. Further more, serious collectors "scan" the market quite frequently, it made more difficult for you to reach it. what do u mean by join mattel? Mattel the company produces toys. Hotwheels is one of their products range. Next time try to ask the store keeper. You maybe the luck 1. I got 2 THunt. I got my 300C normal TH from Isetan MV, by sheer chance since that time the staff was just about to place it on the rack (dunno why, a few of the staff was holding it).